Demand for increased fuel economy numbers has driven the automobile industry to pursue many innovations. In 2015, Ford Motor Company chose to convert its popular F-150 full-size pickup truck body from steel to aluminum. The result? A weight loss of more than 700 pounds and greatly improved fuel efficiency. In order to accomplish such a feat, the Dearborn Truck plant shut down for four weeks. During this time, existing equipment and tooling was completely removed and brand new machinery installed in its place. This even included new robots and conveyor systems. 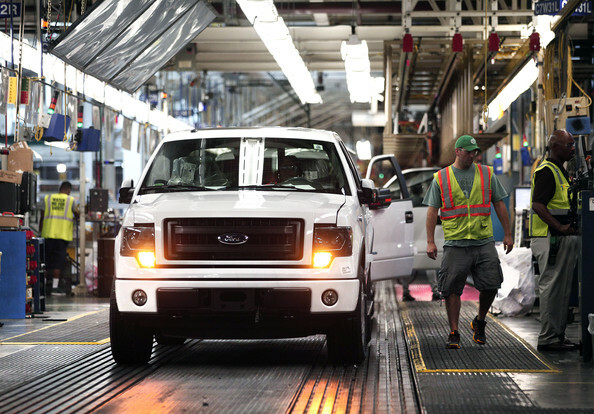 Because the F-150 is such a strong seller for Ford (more than 60,000 per month) it was imperative schedules were monitored, maintained, and carefully coordinate to prevent lost time. Completing a changeover of this magnitude in this short amount of time was unprecedented, but the contractors set an accelerated timeline nonetheless. The project’s General Contractor, Walbridge, selected Motor City Electric Co. to perform all electrical work. This massive overhaul was necessary because the processes for handling aluminum and steel are quite different. This meant that the body shop, paint shop, and final trim line all had to be rebuilt and reconfigured. With demolition completed in week one, installation filled the remaining three weeks. MCE worked around the clock, seven days a week, two 12-hour shifts per day, to ensure that production resumed promptly. In order to make a truck body that was stronger than steel, the F-150 is stamped from heat-treatable 6,000-series alloy aluminum. Because aluminum is less dense than steel, it can be made thicker and still weigh far less than the same part made of thinner steel. Aluminum possesses inherently better properties than steel for dent and ding resistance. In fact, the U.S. military has long used steel frames with aluminum bodies. In place of the spot welds used on previous steel models, the aluminum F-150 uses rivets to affix each panel of the truck’s steel frame. Without welding operations, the plant itself is more open, clean, and much more quiet. The new robots are mounted on overhead rails rather than on the floor adding to the openness. This amazing volume of complex work was completed on time and the Ford Motor plant began building production models at full line speed by the end of 2014.